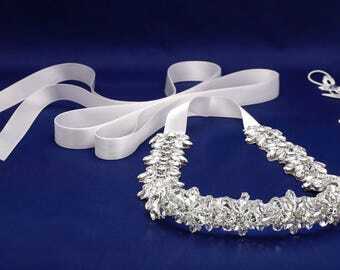 Announcement Crystal bridal sashes, bridal clutches, wedding earrings, brooches, bouquet wraps and more! 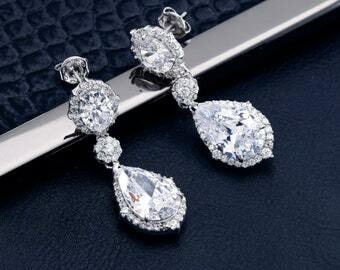 Classic accessories for the modern bride! At SparkleSM, we focus on the glamour and magic of your wedding day, using the highest quality materials to hand sew and customize each design, we create beautiful yet affordable accessories that add the perfect amount of sparkle right where you need it. Our collection features a unique offering of timeless, elegant and romantic pieces that can be worn during and after the wedding and passed down from generation to generation. A mother-daughter team, we hand sew and bead each one of our designs, focusing on quality versus quantity. All of our items are designed and handmade in the USA. We welcome studio appointments for brides in the Connecticut area to view and try on items from our current bridal collection! Send us an email at sparklesmbride [at] gmail.com to set up an appointment soon! 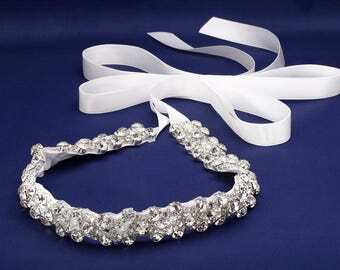 Crystal bridal sashes, bridal clutches, wedding earrings, brooches, bouquet wraps and more! Classic accessories for the modern bride! Honestly beautiful and not super heavy. I love the clasp on it as well since my ears use to be gadged. They look so much better in person. Working on a custom look for bride Loren and our Maguire bridal sash - love it when we get to work with the always gorgeous organza ribbon! Working on this beauty this morning! This is destined to be a custom bridesmaids sash -- love the change of pace! This new beauty will be helping us expand our headband collection, starting with this one! Sewing and beading for brides; inspired by all things sparkly and shiny! Thank you for visiting SparkleSM Bridal! We are a mother-daughter team and we are looking forward to being a small, but special part of your special day! 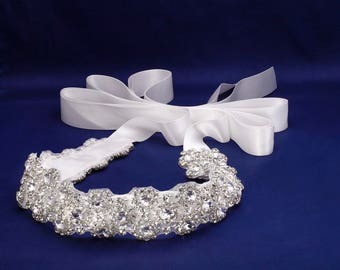 We design and make hand sewn and hand beaded bridal accessories including crystal bridal sashes, rhinestone clutches, bridal jewelry and bouquet wraps. We are proud to offer affordable, high quality, heirloom quality bridal accessories that won't blow your wedding budget! My name is Stephanie -- I started SparkleSM Bridal with my mom to offer brides the quality accessories they need at a fraction of the price charged by some wedding boutiques. Initially my mom and I got into making bridal accessories for my own wedding after visiting several bridal stores and finding out that they charged well in excess of what I could afford. One boutique in particular accessorized my dress with a $1,000 bridal belt! Of course, it was gorgeous and it "made" the dress, but would have totally killed my budget. My mom is a seamstress and she made all of my skating and dance costumes by hand when I was younger, so we turned our attention to designing and making a sash for my dress ourselves. The sash my mom made for me was stunning and in that moment five years ago, just a few weeks before my own wedding, we started SparklesSM Bridal. It was a crazy thing to do at that time, right in the middle of wedding preparations, but we both felt we had found our passion and we haven't looked back! My mom does all the sewing and beading for our bridal collection, while I design and do the photography. From hours of sketching and designing original pieces, to sourcing the highest quality crystals; then hand beading and hand sewing the final items, we take a great deal of pride in our final product and your wedding purchase. Our designs are carefully created to reflect a romantic, elegant and timeless look which will highlight the beauty in your chosen wedding dress. The finished product can be worn again and heirloomed for future generations. All of our bridal pieces are made to order according to the exact needs and specifications of the bride and are never displayed as a sample. We love working with brides to bring their dresses to life by adding just the right sparkly accessories and it is a wonderful feeling to be able to help them save money in their budget by accessorizing a simple gown instead of spending big on a heavily beaded and detailed dress. In addition to our services here on Etsy, we also welcome brides to visit our studio located in Farmington, CT. Please email us at sparklesmbride [!at] gmail.com to schedule your appointment. We would love to hear from you with your questions about any of the pieces in our shop or to get started on a design for your dream bridal accessories! Send us a message today! What sets SparkleSM Bridal aside from everyone else? Quite simply our quality and care of our collection! As soon as you place an order with us, we get to work immediately. As a professionally trained seamstress with 30 years in the business, my mom (and the other half of SparkleSM Bridal) hand sews every sash to order. This translates into a personalized product ensured to make you stand out on your day! We don't use glue or heat application like many other sellers, each of our beads, pearls and crystals are locked in place by sturdy thread. The pattern is then hand-sewn onto your choice of ribbon. This affords us the luxury of customizing your sash just the way you'd like it! And all for a lot less than your local Bridal Store! 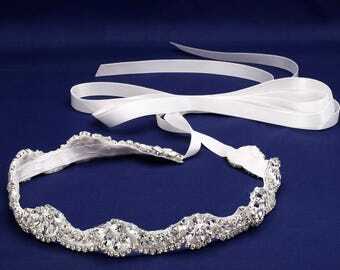 Having trouble envisioning what your selected bridal sash might look like with your dress? We can help with that! Please send a detailed conversation with the sash or sashes you'd like to see photoshopped onto your dress -- with either a photo of you in your dress or a stock image and we'd be happy to bring that design to life. We know how hard it can be to purchase an accessory online and see how it will all work together, SparkleSM Bridal is happy to offer this exclusive service to our brides! We can easily extend the beading on a number of the designs in our collection for a nominal additional cost. Our belts measure a standard 18" long, and many brides choose to extend the beading around the waist to add some detail and pop to the back. Please inquire for additional details and pricing. 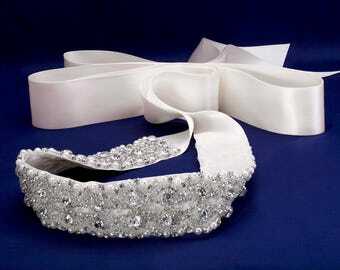 Unless otherwise ordered, our sashes are sewn against 3 yards of satin ribbon and tied in the back with a bow. We happily offer the option of a hook + eye closure for the bride looking to have a seamless transition at the back of her gown. There is a small additional charge for the hook and eye and the beading will need to be extended to accommodate the closure. Please inquire before purchase. Since all of our designs are made-to-order, our production time is about 1-2 weeks on average. We offer rush processing for a nominal fee ($10) if you need it sooner than the stated time frame. Please inquire and include the date you would need your item in hand before purchasing. We ship all our designs in a sturdy padded cardboard box tied with a beautiful ribbon. Your order will arrive ready to gift. Our earrings ship with a complimentary velvet keepsake bag, and acid free paper- gift ready. We ship via USPS First Class Mail. Processing and shipping domestically is usually 3-6 business days. We do offer priority and express shipping for the same rates as charged by USPS, please select when ordering. I want you to be 100% happy with your purchase. If you are not satisfied I will gladly exchange or replace for an item of equal value. Returns can only be made within 3 days of your packages delivery confirmation in the original, unworn condition, and will incur a 15% re-stocking fee upon return for Etsy's fees. I kindly ask that customers refrain from purchasing multiple items to decide which will work best, while planning to return the rest. This is due to the handmade nature of our items. All custom items are final sale. Items must arrive packaged safely in the original box so as to avoid any damage. Refunds will not be processed if the return arrives damaged, please take care in packaging it back. Tracking is recommended.